Too many hot days in the summer can make fish in shallow lakes, ponds and rivers sluggish. The same thing happens in the winter when water temperatures are lower. Why? All fish are cold-blooded. Meaning they can’t keep their body temperature at a constant level like humans and other warm-blooded animals. So the temperature of their surroundings influences the fish’s body temperature and bodily functions. Really high and really low water temperatures reduce the amount of oxygen in the water, making fish less active and picky about when and what they. So here’s the first rule of when to fish: fishing will be slower when it’s too hot or too cold. Understanding this bit of biology will help you decide what kinds of lures and baits to use, and how fast or slow to work them. Work your tackle slower in colder water and faster in warm water. Warm water temperatures make bait fish more active and available to game fish on cool early-spring days. 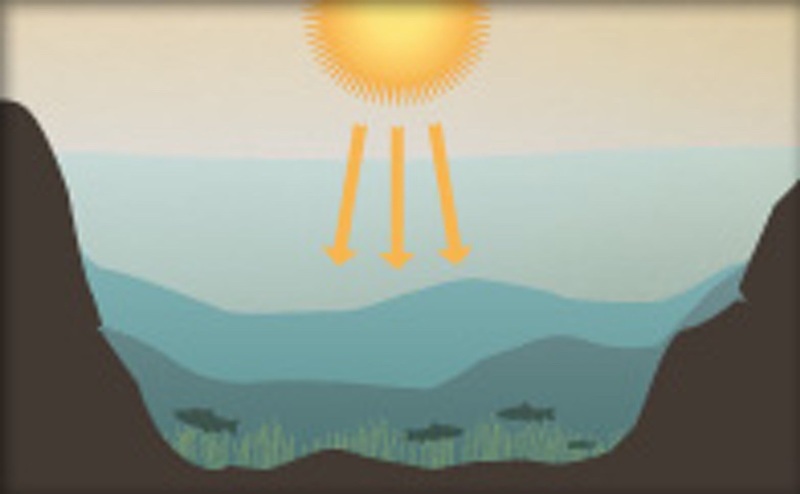 On hot sunny days, fish move to cooler, deeper waters to stay comfortable. High-heat conditions make shallow and top water lures and fishing bait best only in the early morning and late afternoon when cooler temperatures and lower light levels allow fish to cruise the shallows for meals. Fish aren’t biting. The water is cold and doesn’t heat up because the sun is low and the rays bounce off the water. Best to wait until a week or so after thaw, as spring turnover takes time for the water temperature to even out to 39.2 degrees. Fish are biting off and on. The water begins to warm up because rays begin to penetrate the water. Remember to fish the downwind shoreline, as the winds will push the warmer surface water along with surface food into that area. Fish are eating a lot because their metabolism and digestion are cranked. Water is warm because the sun is directly overhead. Fishing is excellent from before sunup to just before mid-morning. At this time of year there is abundant food and cover for fish, so finding hungry fish can be a challenge. Fishing is poor for most of the day. Fish move to deep water to cool off. Fishing is excellent from early sundown until dark as the waters cool and fish rise up from the depths. Fish aren’t biting much from sunup to early morning. The water is cool because the sun is too low to penetrate the water. Fish are biting off and on in warmer, shallow water. The water is generally cool due to the season. Fishing at this point is excellent. Sun is directly overhead for several hours and the water gets more comfortable near the surface. This makes for seasonally good fishing because fish are putting on weight for the winter. Continue reading “Best Times to Fish” here.